Ben Goldfarb's longawaited Eager book is out! Worth the wait! Goldfarb B. 2018. Eager: The Surprising, Secret Life of Beavers and Why They Matter. Chelsea Green Publishing. White River Junction, Vermont. 309 pp. This is one of the most exhaustively researched, authoritative and compelling books on why we might want to turn to beaver as a restoration and conservation partner in existence. Even if you are a seasoned beaver researcher or restoration practitioner, you will learn a ton reading this and be pointed to all sorts of great references and research that Ben uncovered and synthesized. Perhaps more importantly, if you've never paid any attention to this rodent, Ben makes it easy to become interested in their plight and how our's is so intertwined. Ben tells the parallel stories of beaver, North America's complicated history with the rodent, and of the large cast of contemporary characters involved in trying to shape the future of trying to learn something from this amazing ecosystem engineer in about how we manage natural resources and coexist. beaver have now made it to ranger rick! Check out the 'Leave it to Beaver' Article in Ranger Rick! They do a nice job highlighting some Heidi Perryman's effort in Martinez! Greetings: I am pleased to announce Version 2.01 of The Beaver Restoration Guidebook (BRG) is now available on our website (https://www.fws.gov/oregonfwo/promo.cfm?id=177175812). On June 30, 2018, Version 2.0 of the BRG was released and was updated to include an extensive new chapter on urban beavers, including two new case studies, and other updates throughout the guidebook. Version 2.01 includes a relatively minor change in Chapter 7, Urban Beaver Population Management, on the second to last paragraph of page 101; addition of an internet link to Section III on page 187; and the addition of a reference to the Reference Cited Section on page 209.
eaver's range, but is focused primarily on the western United States. I would like to thank our partners for making the Beaver Restoration Guidebook available, including Michael Pollock and Chris Jordan, NMFS NW Fisheries Science Center, Gregory Lewallen, University of Saskatchewan, Kent Woodruff, retired, U.S. Forest Service, and Janine Castro, U.S. Fish and Wildlife Service, Oregon Fish and Wildlife Office. This guidebook was made possible through funding by the North Pacific Landscape Conservation Cooperative. Please distribute this BRG widely to land managers, practitioners, and anyone who is interested in learning more about the cost effectiveness and sustainability of beaver-prompted solutions to accomplish stream, wetland, and floodplain restoration. Interesting video on building BDAs up in Montana. Climate Change Adaptation Through Beaver Mimicry from WCS Climate Adaptation Fund on Vimeo. This AP story is worth a read. For over 60 years the US Department of Agriculture's Wildlife Services division has pursued an aggressive strategy of lethal control and removal of beaver, despite much progress has been made in 'living with beaver' mitigation strategies that have proven more effective and cheaper. Some staff scientists within the agency have continued to ignore the science and improved management practices, and some have gone as far as publishing studies with questionable study designs and interpretation to try to support their practices. It will be interesting to see how this unfolds. 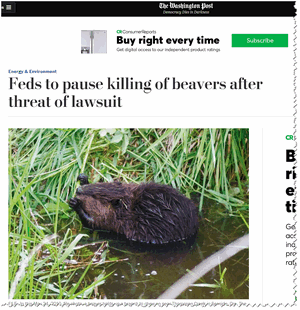 First and foremost, it needs to be recognized that beaver can and do cause undesirable damage to some infrastructure, and mitigation strategies are needed. Lethal control is rarely effective in the long-term, but it could be argued it might be a useful last-resort in the tool-box. This is an interesting angle the plaintiffs are taking invoking an ESA take. 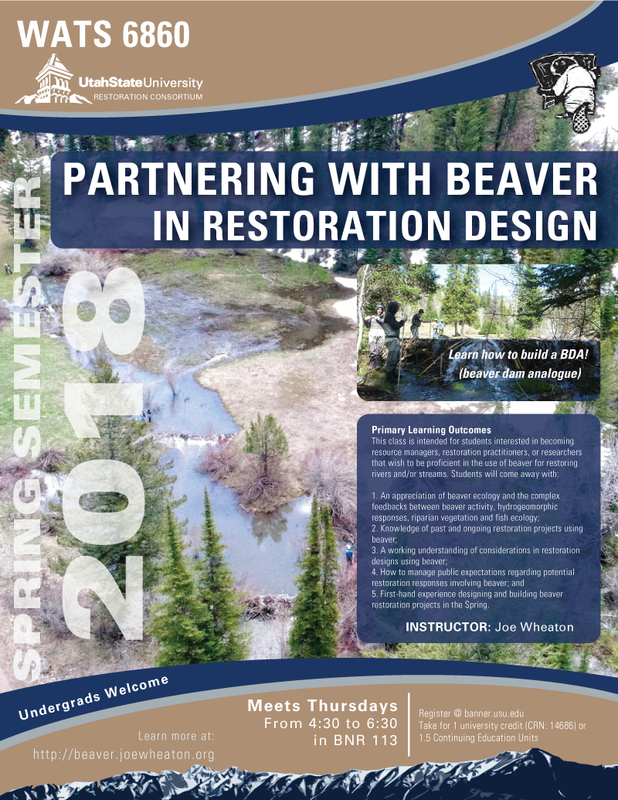 If you're a USU undergrad or graduate student interested in learning more about beaver as a restoration and conservation tool, please consider registering for WATS 6860. This a 1 credit course, and while its listed as WATS 6860, I will accept upper division undergrads in NR programs. We meet about 10 Thursdays from 4:30 to 6:30 and have 2-3 field trips (including one where you will learn how to design and build beaver dam analogues yourself). Shout with questions. I went up to Cochrane, Alberta to give a talk at a 'Putting Beavers to Work for Watershed Resiliency and Restoration Symposium' Hosted by the Miistakis Institute and the Alberta Riparian Habitat Management Society (Cows and Fish). It was fun to sit on a question panel with Cherie Westbrook & Glynnis Hood (whom I'd never met), and meet a bunch of great folks doing really interesting work on beaver up in Canada. Joe recently delivered a talk on Beaver Dam Analogues to the UPCD-WRI Regional Partnership Workshop in Richfield, UT. The slides are available on ResearchGate. If you've like a brief overview of BRAT (Beaver Restoration Assessment Tool), the video below is from a BLM webinar we gave recently. This was a webinar for BLM's joint forum between the Soil, Water & Air Group, Fisheries and Aquatics Group, and Riparian Group. We were asked to focus on how BRAT can be used in planning and prioritizing The video also tacks on a brief introduction to R-CAT (Riparian Condition Assessment Tool) at the end. 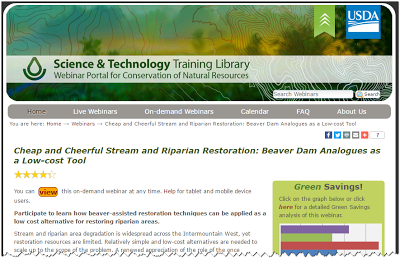 Joe Wheaton (USU) and Jeremy Maestas (NRCS) delivered a webinar on 'Cheap & Cheerful Stream and Riparian Restoration: Beaver Dam Analogues as a Low-Cost Tool' for NRCS as part of their Conservation Webinar Series on March 22, 2017. Roughly 639 participants attended the webinar. You can view the webinar here or download slides at Research Gate.